Many different sets available with parallel thicknesses of 1/8″, 5/32″, 3/16″, 1/4″, 3/8″ and 1/2″. Parallel to .0003; within .001 on overall size. Case hardened to 55-62 rc on top and bottom sides. Great for layout work, setups and various uses as standards. All parallels are 6″ in length. Standard sets supplied in a plastic case. 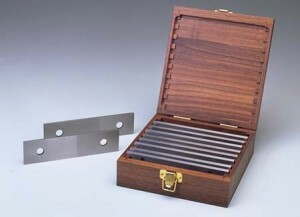 Wood case available at an additional cost.